154 Stone Creek Drive Fisherville, KY 40023 | Home for Sale | MLS #1362269 | Joe Hayden Real Estate Team - Your Real Estate Experts! Located on a quiet cul-de-sac in the desirable Stoneridge Estates Subdivision, you will find this special custom built home at 154 Stone Creek Drive. Constructed on a beautiful wooded lot, this home has been meticulously cared for and has had many recent updates - a new roof, garage doors, blinds, new carpet on stairs and in master bedroom, fresh paint, a new refrigerator and dishwasher, plus new hardwood flooring found in the entryway, dining room, great room and kitchen. The HVAC system was replaced in 2009 with a Trane energy efficient dual fuel heat pump and is still under warranty. 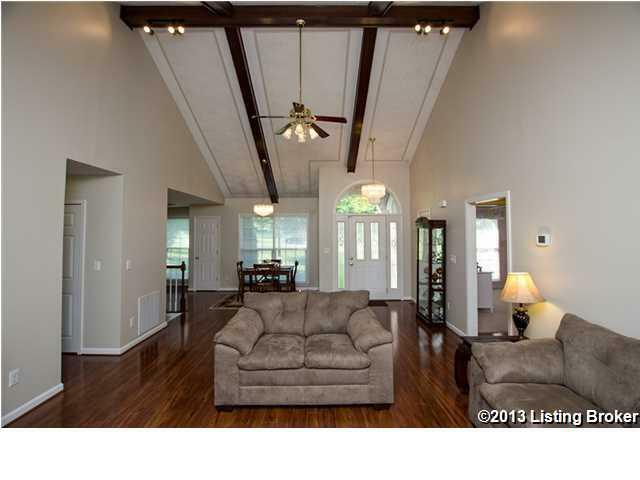 The open floor plan has a vaulted ceiling with robust, bold beams that you will see upon entering the home. The great room has double doors that open onto a deck for entertaining, barbecues or just to sit quietly and survey the magnificent property! An abundance of windows allows for beautiful "framed" views of the 1 acre corner lot, including the shade, fruit and flowering trees adorning the gently rolling landscape. The kitchen features a large island with cabinets below and a trey ceiling above. 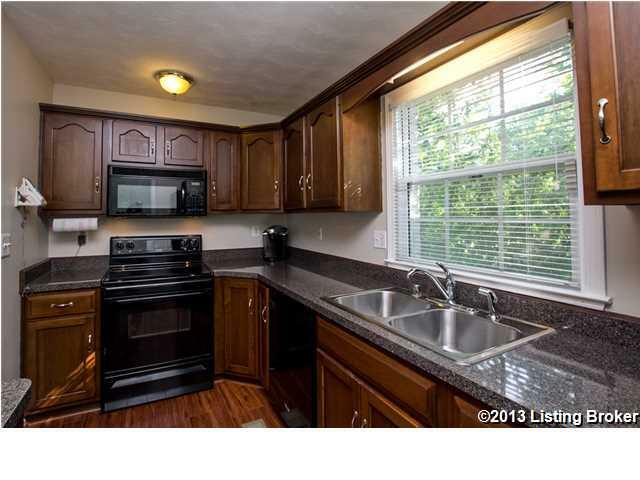 The island doubles as a convenient breakfast bar for casual dining. All 3 bedrooms and the laundry area are on the main floor making for easy living while you enjoy your surroundings. The split floor plan features two bedrooms separated by a full bathroom on the opposite side of the home of the master bedroom. Every bedroom has great views out the windows and spacious closets with closet organizers already installed. 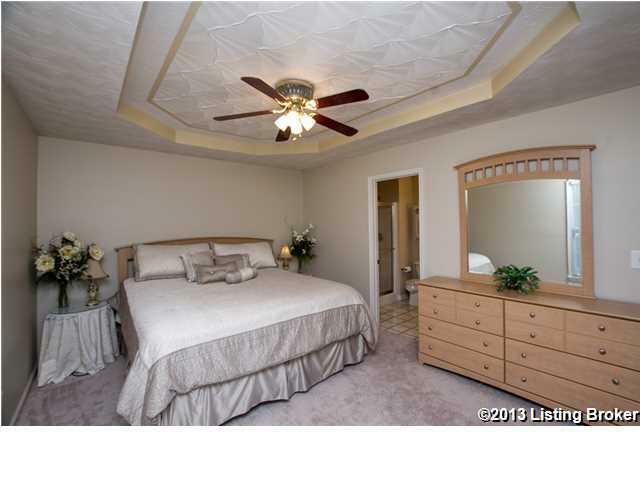 On the other side of the main floor, you will find the master bedroom which has 3 closets for maximum storage. The en suite master bathroom features a double vanity and a shower with dual shower heads. The lower level walk-out basement has a large family room with double doors to the lower patio, a 3rd full bathroom and a bonus room which can be used as an office, exercise room or guest room. The back entry lower-level garage is extra deep and can accommodate extended size trucks, boats or trailers. Don't miss the additional storage in the garage tucked away under the stairs! A security system has been installed for extra safety and peace of mind. 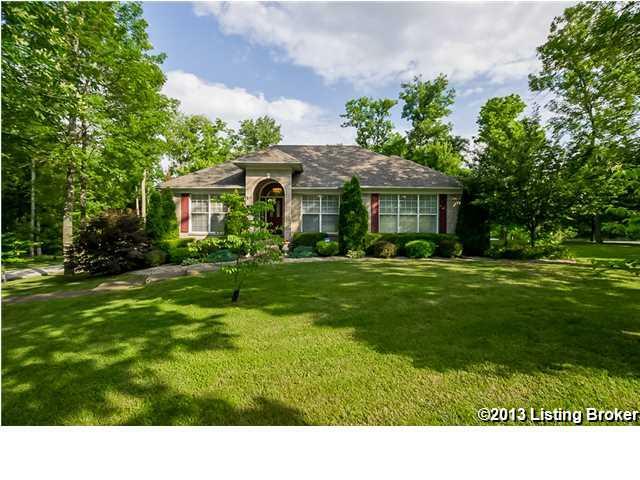 Come visit 154 Stone Creek Drive today and get ready to fall in love with this awesome property!